ISO/IEC 27034 (Application Security), which can be purchased from International Organization for Standardization (ISO) and national standards bodies, is designed to help organisations build security throughout the life cycle of applications. There is a preview of the contents and first few pages of Part 1 on the IEC website. Part 1 presents an overview of application security and introduces definitions, concepts, principles and processes involved in application security. Annex A (informative) provides an example illustrating how an existing software development process can be mapped to some of the components and processes of ISO/IEC 27034. Generally speaking, an organization using any development life cycle should perform a mapping such as the one described in Annex A, and add whatever missing components or processes are needed for compliance with ISO/IEC 27034. This is very useful but I wondered how a comparison with Open SAMM might look. I have therefore created the table below indicating how the processes and resources mapped to SDL relate to the 12 security practices defined in Open SAMM. The large diamond symbol is used to indicated where an Open SAMM practice has a very close relationship with a topic within ISO/IEC 27034 and a smaller diamond for weaker relationships. 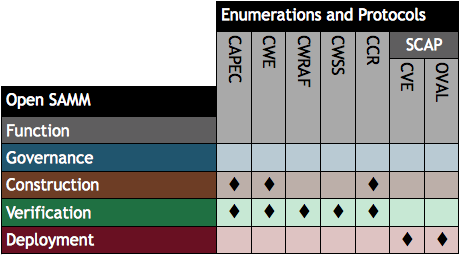 The ISO/IEC 27034 “life cycle reference model” appears to be most closely aligned with the idea of an organisation-specific “software assurance programme” in SAMM combined with a risk-based approach to applying security to different applications, and within sub-parts of application systems. We can also see the SAMM construction, verification and deployment practices primarily relate to the ISO/IEC 27034 application security control library used for the overall organisation and individual applications, as well as the actual use of the framework during acquisition/development, deployment and operation of (provisioning and operating) the application. SAMM is available to download free of charge, and can also be purchased at-cost as a colour soft cover book. I have summarised the slide in the table below. For further security registries, description languages and standardised processes see the Making Security Measurable website. Risk Analysis and Measurement with CWRAF is being presented at AppSec DC 2012 in April.